Present: Heath Braun, Nate Shilman, Jerry Ford, Craig Whippo, Greg Walter, Katsu Ogawa, Rocky Stoltz, and Jon Stika. All three beers for “A Chocolate Affair Plus” have been brewed and packaged. Jon brewed an IPA and Chocolate Oatmeal Stout, and Rocky brewed a German Alt. Discussed beer carbonation and dry hopping. Present: Craig Whippo, Greg Walter, Rocky Stoltz, Ryan Jilek, Jerry Ford, and Jon Stika. Rocky, Greg, Craig, and Ryan will plan to represent the club at the DSU Heritage Foundation YuleTyme event on December 8th, 2018 at the Beisiot Activities Center in Dickinson. They will serve SnowPlow Porter, Fuggle IPA, and Reindeer Spit Brown Ale to those in attendance. 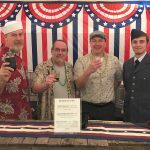 Jon reported that he and his wife, Eve, served Brown Ale that Jon had brewed to approximately 60 in attendance at a beer tasting event at Edgewood Hawk’s Point in Dickinson on November 8th, 2018. Rocky reported that two members have purchased carbon dioxide from the club carbon dioxide supply thus far. The charge is $2.00 per pound of gas to members of the club. Two Track Malting is offering any of its malts sold by the 50 pound bag at $0.85 per pound, or minimum order of 300 pounds at $0.65 per pound to home brewer club members. Jon suggested that those interested in brewing a beer to be served at “A Chocolate Affair Plus” fund raising event for Best Friends Mentoring Program of Dickinson should have their beer ready by April. The event will likely be planned for late April. Members can be reimbursed by the club for ingredients of a batch of beer brewed for the event. Jon plans to brew a chocolate oatmeal stout for the event. 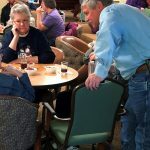 Jon Stika visits with residents at Edgewood Hawk’s Point in Dickinson on November 8, 2018 during a beer taste event. The Heart River Homebrewers provided an English Brown Ale for the approximately 60 people attending the event to enjoy. Present: Rocky Stoltz, Derek Fox, Jerry Ford, Greg Walter, Katsu Ogawa and Jon Stika. Rocky offered to host the next club meeting at his home on November 29th, to which the group assembled concurred. Jon will serve a club-sponsored Brown Ale at Edgewood – Hawk’s Point on November 8th.